"This is a recipe for apple pie made without apples. It has all the characteristics of an apple pie with apples. If you didn't know better, you'd think that there really were apples in it. This is an old chemistry lab experiment to teach the limits of human senses." Roll out pastry and set aside. Bring water to a boil in a large saucepan. In a small bowl mix together sugar and cream of tartar. Add mixture to boiling water. Stir, then add crackers, one at a time. Boil for 3 minutes, but do not stir. Pour cracker mixture into pastry-lined pie pan. Sprinkle crackers with cinnamon and dot with butter or margarine. Cover with top pastry. Seal edges and cut steam vents in top. Bake in preheated oven for 30 minutes, until crust is golden brown. May need to cover top pastry partway through baking to prevent overbrowning. This recipe was popular in the 20s,30s and 40s because apples were hard to come by and expensive. 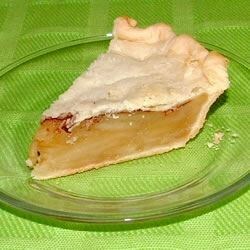 It's a great recipe and you would never know that the pie has no apples! This recipe is awesome, esp for people with an apple allergy.